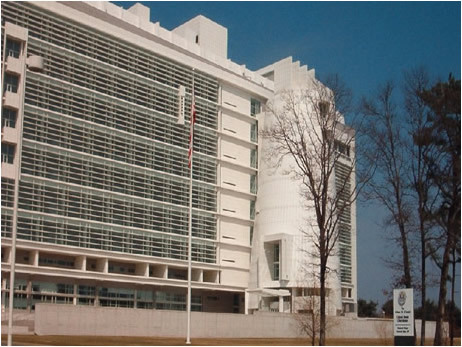 The new Federal Courthouse in Central Islip opened in September 2000. Upon entering the Courthouse, you will need to go through a metal detector. VERY IMPORTANT: You are not permitted to take cellular phones into the building. The U.S. Marshal’s Service, which provides building security, will make you go back to your car to leave your cell phone there if you bring it into the building. They will only let you check it if you have no car. There is a coffee shop on the first floor of the Courthouse which serves breakfast and lunch, and pay phones on every floor. If you are going to court for your first bankruptcy hearing, it is called the Meeting of Creditors. They are always held in either room 561 or 563. You cannot miss the Federal Courthouse. It is the tallest building in Suffolk County and it is located in the same complex that contains the Suffolk County Supreme Court. It is a very large white building with an unusual-looking rotunda that looks like a missile silo. The building is located off Exit 43A on the Southern State Parkway and it is at the Northeast corner of Carleton Avenue and the Southern State Parkway. If coming from the West, take Southern State Parkway to Exit 43A. You will loop over Southern State Parkway. Please follow signs to the Court and into the parking lot. If coming from the North, take Route 111 which merges with Carleton Avenue. The Courthouse is on the left, approximately 2 ½ miles south of the Long Island Rail Road tracks in Central Islip. It is just before Southern State Parkway. If using the Long Island Rail Road, the station is the Central Islip station, but you will need taxi accommodations to go the 2 ½ miles south to the Courthouse. We tell our clients to time their travel so that they are at the Courthouse and in the hearing room at least 30 minutes before the scheduled hearing.